Sarah Silverman, her pearly whites and a very clingy coffee 'boyfriend' all star in Orbit's latest, a very tongue-in-cheek spot entitled 'Lipstick'. 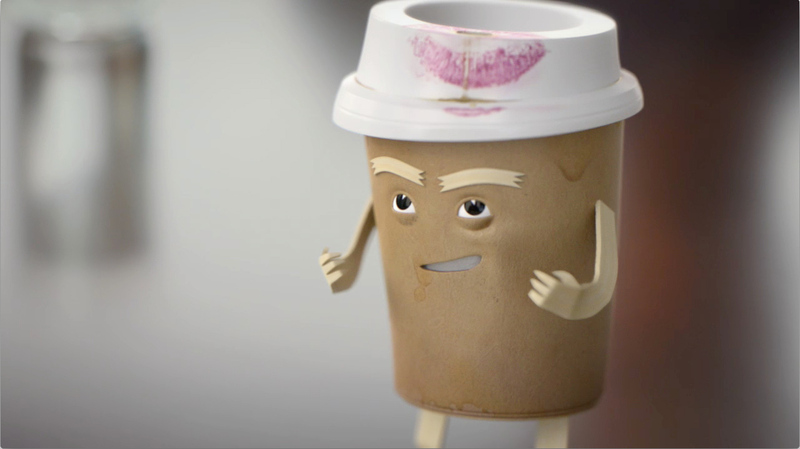 Directed by Hank Perlman through Hungryman, 'Lipstick' is the newest film in Orbit's Food Gang campaign with BBDO, and features Coffee's first big break as a leading man opposite the hilarious Silverman. Head of 3D Steve Beck talks us through the process: "Getting the animation absolutely spot on was crucial to the comedy and timing in Coffee's character. He needed to feel natural in his reactions and movements, not overly slapstick to allow the brilliant comedic script from the BBDO team to enhance his personality rather than becoming too much like a cartoon. It was a fun approach and we worked hard to help push the creative boundaries of the character." He adds: "Naotaka Minami, 3D artist alongside the entire composting team did an incredible job in setting Coffee in to the scene, with a shallow depth of field, reflections and some very clever shading and lighting - they seamlessly bring him alive in the spot." Finally, Steve explains: "He was a heart-broken 'Coffee' and it's a shame my favorite line didn't quite make it through the final cut; "half of me is in you! ", a hysterical but not-so-appropriate way for Coffee to express his love for Sarah!". The lesson? Keep Coffee in the friend zone.